On April 26, President Donald Trump issued an executive order calling for a review of national monuments designated over the last 21 years. On May 5, the Department of the Interior released a list of 27 National Monuments under review and is seeking public comments on this process. Much of the attention has been on the Bear Ears National Monument designation in Utah, completed in the waning days of President Barack Obama’s administration. National monument protections are important to the future of the Pacific Crest Trail. Nearly 200 miles of the PCT cross five national monuments: Cascade-Siskiyou, Santa Rosa and San Jacinto, Devil’s Postpile, Sand to Snow and San Gabriel Mountains. Three of those—Cascade-Siskiyou, Sand to Snow and San Gabriel Mountains—are listed under this current review. In early 2016, President Obama designated the Sand to Snow National Monument. He also expanded the size of the Cascade-Siskiyou, doubling the protected PCT miles to 38 inside the monument. We believe it’s important that these protections remain in place so that the PCT experience will be there for future generations. At the Pacific Crest Trail Association, we regard national monuments as far-sighted protections for iconic landscapes that hold incalculable value for outdoor recreation, landscape preservation, cultural heritage recognition, and protection of wildlife and clean air and water sources. Kyle Ignacio on Mount Baden Powell. Photo by Mara Geraldine Ignacio. National monuments are a boon for small town economies along the trail. Communities near national monuments see economic growth through tourism, recreation and improved property values. Across the country, monuments draw hikers, climbers, hunters, anglers, bicyclists boaters and equestrians alike. An updated study by the Outdoor Industry Association shows that outdoor recreation generates $887 billion in consumer spending annually, and supports 7.6 million jobs in the U.S. The 1906 Antiquities Act, signed into law by President Theodore Roosevelt, enables Congress or the president to safeguard public land by designating national monuments. It’s one of the country’s most enduring and important conservation tools. A monument designation allows for a variety of uses while protecting an area’s unique natural, historic or cultural heritage. Since the Antiquities Act was passed, 16 presidents from both political parties have created 150 national monuments, protecting millions of acres of public land. In most cases, the protections were put in place only after robust discussions and broad support from local communities and stakeholders. Many places once designated as monuments, including Grand Teton, the Grand Canyon and Joshua Tree, are now national parks. During this time of review, it will be extremely important for people who love the outdoors to speak up in defense of their public lands. This is your opportunity to let your government know why you love the PCT, why protecting it is the right thing for the country and future generations and why these national monument designations should be left as is. You can submit comments online to the Interior Department. Comments by mail can be sent to Monument Review, MS-1530, U.S. Department of the Interior, 1849 C Street NW, Washington, DC 20240. The deadline for submitting comments is July 10. For 30 miles, the Pacific Crest Trail winds through the 154,000 acres of the Sand to Snow National Monument. From the sweltering heat of the Colorado Desert near Interstate 10, through the San Gorgonio Wilderness, to the Jeffrey pine and incense-cedar of the San Bernardino Mountains at Onyx summit, the PCT travels through the most botanically diverse mountain range of its size in North America. Within the boundary of the monument, the trail crosses the San Andreas Fault, climbs through desert chaparral, crosses the Whitewater River and Mission Creek before climbing higher through pinyon pines, finally entering the 7,000-foot transition zone categorized by the crisp air and enveloping forests. The PCT serves as a ribbon tying these areas together by providing access to the remote areas of the San Gorgonio Wilderness. The PCT passes through the Cascade-Siskiyou National Monument for 38 miles. The monument is punctuated by the iconic volcanic plug known as Pilot Rock immediately north of the California/Oregon border. As the PCT traverses the Siskiyou Crest, it enters the Monument just west of Interstate 5, passes Pilot Rock (an important landmark on the Applegate fork of the California to Oregon emigrant trail) and swings north toward Oregon’s southernmost Cascade volcano, Mount McLoughlin. The monument section of the PCT is very popular with hikers and horseback riders from the nearby communities of the Rogue Valley to the west and the Klamath Basin to the east. The many roads within the monument afford easy access to beautiful stretches of the PCT with sweeping views of the Rogue Valley. In the spring, the wildflower displays rival the high mountain ranges to the north and south while the morel mushrooms attract fungus hunters from around the region. Two large lakes, Hyatt and Howard Prairie, bring anglers and the PCT in the Monument is a popular access for fall hunters. 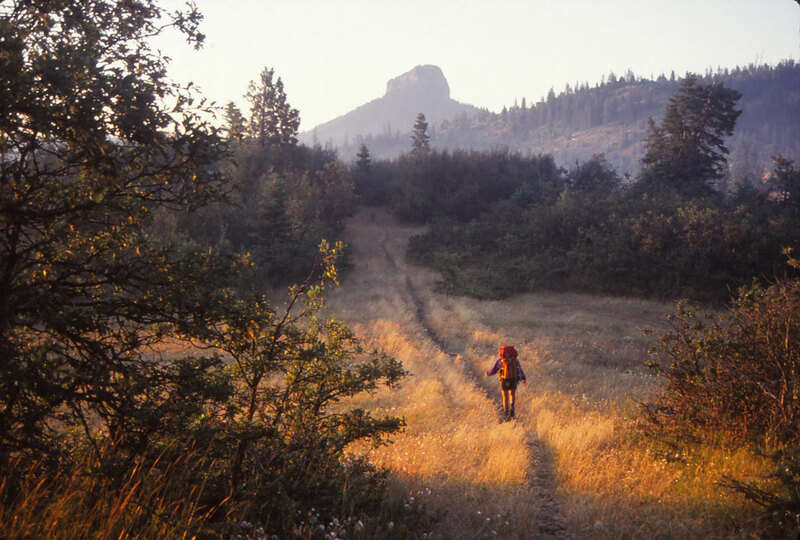 Since its designation by President Bill Clinton in 2000, the Cascade-Siskiyou National Monument has become an important part of the culture of Southwest Oregon and the PCT through the monument a is vital avenue of exploration for people on foot as well as the traditional stock user. Approaching Pilot Rock in Cascade Siskiyou National Monument. Photo by Dave Fleischman. 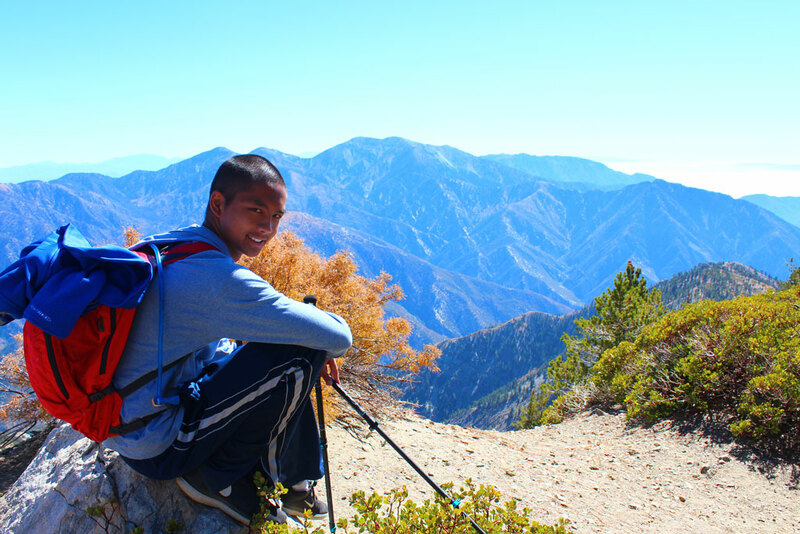 More than 15 million people live within 90 minutes of the PCT within the San Gabriel Mountains National Monument. Crossing both the Angeles and San Bernardino national forests, 87 miles of the PCT traverse this 346,177-acre monument. Within the monument, the PCT travels to iconic Mount Baden-Powell, straddles the northern ridge line of the Sheep Mountain Wilderness and winds through the Pleasant View Ridge Wilderness. Along Highway 2 there are many easy access points to the PCT. The trail provides countless recreational activities, countering the shortage of parks and open space in Los Angeles County. The PCT in the San Gabriel Mountains National Monument is a fine example of crucial resource protection, providing access and public health opportunities for visitors from the big cities and many small mountain communities along the trail.